OsteoFab is the coolest 3-D printed material you’d never want to use. 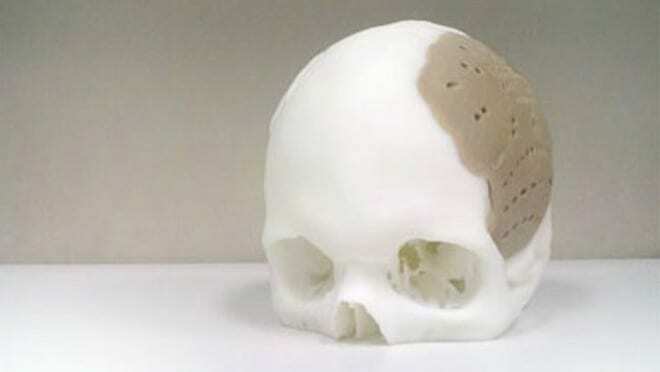 Invented by plastics research firm Oxford Performance Materials (OPM), this first-of-its-kind polyketone can be used by 3-D printers to repair large sections of a damaged skull. It was recently cleared for use by the FDA and is being used in critical surgical procedures all over the world. The typical OsteoFab customer has been in a car accident or suffered other physical trauma. In the emergency room, doctors stabilize the patient and and get a CAT scan. The OPM engineering team builds on the data from the scan and creates printable CAD files that feature screw holes and scaffolding necessary for implantation. A surgeon approves the design and it’s printed at OPM using a selective laser sintering 3-D printer. A technician laser-scans the final part for quality control and ships it to the hospital where it’s sterilized and implanted. The treatment can take several months and and costs $8,000-15,000, but also provides benefits no other process can match. Since the implant is custom built to fit the patient, it makes surgery quicker which saves money and can help reduce the chance of complications. It also reduces cosmetic defects caused by off-the-shelf parts. The polymer was also deemed well suited for spinal implants since it is biocompatible, has mechanical properties similar to bone, and also provokes a positive cellular response that allows new bone to grow on top of the implants. But, there were also limitations — each implant was labor intensive, which introduced the opportunity for defects. “Seven years ago I picked up an article and it was about surgeons dreaming of printing implants,” explains DeFelice, who says he immediately recognized the opportunity and called on his team of polymer scientists, mechanical engineers, and clinical experts to explore the potential. “We looked at our materials technology and realized that we could make some changes and it could work,” he says. He also adds that it doesn’t hurt that the president is talking about 3-D printing. The material was cleared for use by the FDA in February, but has been available in Europe and used successfully in procedures already.